We use a combination of biochemical methods, functional genomics and microbiological approaches to (i) elucidate the cell envelope structure and determine the biological activities of its lipid constituents and (ii) decipher the structure and biosynthetic pathway of mycolic acids (MA), very-long chain fatty acids and major components of the cell envelope, essential for mycobacterial survival. The team has a long history in studying the physiology of mycobacteria, notably the biogenesis of the mycobacterial envelopes as well as an outstanding expertise in analytical and structural biochemistry of lipids and polysaccharides, with multiple collaborations including pharmaceutical groups. Our focus is a better understanding of the envelope through (i) deciphering mycobacterial envelope constituents, (ii) elucidation of their metabolic pathways in order to (iii) discover mycobacterial targets for drug discovery. During the recent past years, the team has generated a comprehensive knowledge of the mycobacterial cell envelope through successful dissection and isolation of the different entities (mycomembrane, cell-wall, capsule) and studied the distribution of proteins among these different compartments. The roles of protein post-translational modifications, such as O-mycoloylation and Ser/Thr phosphorylation, were deciphered. We have also discovered novel potential therapeutic targets involved in M. tuberculosis virulence, with valorization potential (filed patents), in the biosynthesis pathway of the mycolic acid-containing lipids. The latter, original components of the mycomembrane, are essential for the survival of mycobacteria, as well as the virulence and the persistence of pathogenic mycobacteria within infected organisms. The team was also successful in setting up and performing a biochemical screening on a validated target from the mycolic acid biosynthesis (FadD32), with selected hits obtained and a pharmacophore defined for further high potential for MedChem development. Our group significantly contributes to teaching and knowledge dissemination at Paul Sabatier (Toulouse III) University with five professor and associate professors, as well as training through research (PhD and Master students). Organization of the mycobacterial envelope. AG, arabinogalactan; PG, peptidoglycan; GL, granular layer; PM, plasma membrane. Mourer, M, Duval, RE, Constant, P, Daffé, M, Regnouf-de-Vains, JB (2018). Impact of tetracationic calixarene conformation - from conic structure to expanded bolaform - on their antibacterial and antimycobacterial activities. ChemBioChem, in press. Bannantine JP*, Etienne G, Laval F, Lemassu A, Daffé M, Bayles DO, Ganneau C, Branger M, Cochard T, Bay S & Biet F* (2017) Cell Wall Peptidolipids of Mycobacterium avium: From Genetic Prediction to Exact Structure of a Nonribosomal Peptide. Mol Microbiol 105:525-39. Burbaud, S., Laval, F., Lemassu, A., Daffé, M., Guilhot, C. and Chalut, C. (2016). Trehalose polyphleates are produced by a glycolipid biosynthetic pathway conserved across phylogenetically distant mycobacteria. Cell Chem. Biol. 23: 278-289. Quémard A. (2016) New Insights into the Mycolate-Containing Compound Biosynthesis and Transport in Mycobacteria. Trends in Microbiology, ISSN0966-842X, 24:725-738. Guillet, V., Galandrin, S., Maveyraud, L., Ladevèze, S., Mariaule, V., Bon, C., Eynard, N., Daffé, M., Marrakchi, H. and Mourey, L. (2016). Insight into Structure-Function Relationships and Inhibition of the Fatty Acyl-AMP Ligase (FadD32) Orthologs from Mycobacteria. J. Biol. Chem. 291: 7973-89. Slama, N., Jamet, S., Frigui, W., Pawlik, A., Bottai, D., Laval, F., Constant, P., Lemassu, A., Cam, K., Daffé, M., Brosch, R., Eynard, N., and Quémard, A. (2016). The changes in mycolic acid structures caused by hadC mutation have a dramatic effect on virulence of Mycobacterium tuberculosis. Mol. Microbiol.99: 794-807. Chollet A., Stigliani J-L., Pasca M.R., Mori G., Lherbet C., Constant P., Quémard A., Bernadou J., Pratviel G., Bernardes-Génisson V. (2016). Evaluation of the inhibitory activity of (aza)isoindolinone-type compounds: towards in vitro InhA action, Mycobacterium tuberculosis growth and mycolic acid biosynthesis. Chemical Biology & Drug Design, ISSN1747-0285, 88:740-755. Jamet, S., Slama, N., Domingues, J., Laval, F., Texier, P., Eynard, N., Quémard, A., Peixoto, A., Lemassu, A., Daffé, M. and Cam, K. (2015). The non-essential mycolic acids biosynthesis genes hadA and hadC contribute to the physiology and fitness of Mycobacterium smegmatis. PLoS One 10(12):e0145883. Ehebauer, M.T., Zimmermann, M., Jakobi, A.J., Noens, E.E., Laubitz, D., Cichocki, B., Marrakchi, H., Lanéelle, M.A., Daffé, M., Sachse, C, Dziembowski, A., Sauer, U, Wilmanns, M. (2015) Characterization of the Mycobacterial Acyl-CoA Carboxylase Holo Complexes reveals their Functional Expansion into Amino Acid Catabolism. PLoS Pathog 19;11(2):e1004623. doi: 10.1371/journal.ppat.1004623. Jamet, S., Quentin, Y., Coudray,C., Texier, P., Laval, F., Daffé, M., Fichant, G. and Cam, K. (2015) Evolution of mycolic acid biosynthesis genes and their regulation during starvation in Mycobacterium tuberculosis. J. Bacteriol. 197: 3797-811. Flores-Valdez, M.A., Aceves-Sánchez, M. J., Pedroza-Roldán, C., Vega-Domínguez, P., Prado-Montes de Oca, E., Bravo-Madrigal, J., Laval, F., Daffé, M., Koestler, B., Waters, C. (2015) The cyclic di-GMP phosphodiesterase gene Rv1357c/BCG1419c affects BCG pellicle production and in vivo maintenance. IUBMB Life. 2015 Feb;67(2):129-38. doi: 10.1002/iub.1353. Epub 2015. Soetaert, K., Rens, C., Wang, X-M., De Bruyn, J., Lanéelle, M.A., Laval, F., Lemassu, A., Daffé, M., Bifani, P., Fontaine, V. and Lefèvre, P. (2015). Drug screening for increased vancomycin susceptibility in mycobacteria: a new approach to identify synergistic activity against multi-drug resistant mycobacteria. Antimicrob. Agents Chemother. 59: 5057-60. Massimba-Dibama, H., Mourer, M., Constant, P., Daffé, M., and Regnouf-de-Vains, JB (2015). guanidinium compounds with sub-micromolar activities of new against Mycobacterium tuberculosis. Synthesis, characterization and biological evaluations. Bioorg. Med. Chem. 23: 5410-5418. Gavalda S., Bardou F., Laval F., Bon C., Malaga W., Chalut C., Guilhot C., Mourey L., Daffé M., Quémard A (2014) The polyketide synthase Pks13 catalyzes a novel mechanism of lipid transfer in mycobacteria. Chem. Biol., 21:1660-9. doi: 10.1016/j.chembiol.2014.10.011. Epub 2014 Nov 26. Kaufmann S, Alves P, Fae K, Houthuys E, Dorhoi A, Kreuchwig A, Furkert J, Barison N, Diehl A, Munder A, Constant P, Skrahina T, Guhlich-Bornhof U, Klemm M, Koehler A-B, Bandermann S, Goosmann C, Mollenkopf H-J, Hurwitz R, Brinkmann V, Fillatreau S, Daffe M, Tummler B, Kolbe M, Oschkinat H, and Krause G. (2014) AhR sensing of bacterial pigments orchestrates antibacterial defense. Nature, 512:387-92. Gonzalo-Asensio, J., Malaga, W, Pawlik, A., Astarie-Dequeker, C., Passemar, C., Moreau, F., Laval, F., Daffé, M., Martin, C., Brosch, R. and Guilhot, C. (2014) Evolutionary history of tuberculosis shaped by conserved mutations in the PhoPR virulence regulator. PNAS, 111:11491-6. Daffé M.* and Zuber, B. (2014) The fascinating coat surrounding mycobacteria. In H. Remaut and R. Fronzes (eds), “Bacterial Membranes: Structural and Molecular Biology”, pp 179-192. Caister Academic Press. Marrakchi, H., Lanéelle, M.-A. and Daffé, M.* (2014) Mycolic acids : structures, biosynthesis and beyond. Chem Biol, 21: 67-85. Daffé, M., Crick, D. and Jackson, M.* (2014) Genetics of capsular polysaccharides and cell envelope (glyco)lipids" in “’Molecular Genetics of Mycobacteria" (G. Hatfull & W. Jacobs, eds) 2nd edition. ASM press. Washington, D.C.
Bazet Lyonnet B., Diacovich L., Cabruja M., Bardou F., Quémard A., Gago G., Gramajo H. (2014) Pleiotropic effect of AccD5 and AccE5 depletion in acyl-coenzyme A carboxylase activity and in lipid biosynthesis in mycobacteria. PLoS ONE, 9:e99853. Carel, C#., Nukdee, K#., Cantaloube, S., Bonne, M., Diagne, C.T., Laval, F., Daffé, M. and Zerbib, D*. (2014) Mycobacterium tuberculosis proteins involved in Mycolic acid synthesis and transport localize dynamically to the old growing pole and septum. PLoS One 9(5): e97148. .
Rath, P., Saurel, O., Tropis, M., Daffé, M., Demange, P. and Milon, A. * (2013) NMR Localisation of the O-mycoloylation on PorH, a channel forming peptide from Corynebacterium glutamicum. FEBS Lett 587: 3687-3691. Rath, P., Saurel, O., Czaplicki, G., Tropis, M., Daffé, M., Ghazi, A., Demange, P. and Milon, A. * (2013) Cord factor (Trehalose 6,6’-dimycolate) forms fully stable and non-permeable lipid bilayers required for a functional outer membrane. Biochim Biophys Acta (Biomembranes) 18: 576 – 87. Lanéelle, M.A., Tropis, M. and Daffé, M*. (2013) Current knowledge on mycolic acids in Coynebacterium glutamicum and their relevance for biotechnological processes. Appl Microbiol Biotech 97: 9923-30. Huc, E., de Souza d’Auria, C., Li de la Sierra-Gallay, I., Salmeron, C., van Tilbeurgh, H., Bayan, N., Houssin, C., Daffe, M.*, and Tropis, M.* (2013) Identification of a mycoloyltransferase selectively involved in O-acylation of polypeptides in Corynebacteriales. J. Bacteriol. 195: 4121-28. Galandrin, S., Guillet, V., Rane, R., Léger, M., Radha, N., Eynard, N., Das, K., Balganesh, T., Mourey, L. Daffé, M. and Marrakchi, H. (2013) Assay development for identifying inhibitors of the mycobacterial FadD32 activity. J. Biomol. Screening [Epub ahead of print]. Lanéelle, M.A, Eynard, N., Spina, L., Lemassu, A., Laval, F., Huc, E., Etienne, G., Marrakchi, H. and Daffé, M. (2013) Structural elucidation and genomic scrutiny of the C60–C100 mycolic acids of Segniliparus rotundus. Microbiology 159: 191-203. Hedlhi, D., Denis, O., Barkan, D., Daffé, M., Glickman, M.S. and Hyghen, K.* (2013) Mycobacterium tuberculosis mutants lacking oxygenated mycolates show increased immunogenicity and protective efficacy as compared to M. bovis BCG vaccine in an experimental mouse model. PLoS One 8: e76442. Grzegorzewicz AE, Korduláková J, Jones V, Born SE, Belardinelli JM, Vaquié A, Gundi VA, Madacki J, Slama N, Laval F, Vaubourgeix J, Crew RM, Gicquel B, Daffé M, Morbidoni HR, Brennan PJ, Quémard A, McNeil MR, Jackson M. (2012) A common mechanism of inhibition of the Mycobacterium tuberculosis mycolic acid biosynthetic pathway by isoxyl and thiacetazone. J Biol Chem. 287:38434-41. doi: 10.1074/jbc.M112.400994. Epub 2012 Sep 21. Ibrahim H, Furiga A, Najahi E, Pigasse Hénocq C, Nallet JP, Roques C, Aubouy A, Sauvain M, Constant P, Daffé M, Nepveu F. (2012) Antibacterial, antifungal and antileishmanial activities of indolone-N-oxide derivatives. J Antibiot (Tokyo). 65:499-504. doi: 10.1038/ja.2012.60. Epub 2012 Jul 25. Bergeret F, Gavalda S, Chalut C, Malaga W, Quémard A, Pedelacq JD, Daffé M, Guilhot C, Mourey L, Bon C. (2012) Biochemical and structural study of the atypical acyltransferase domain from the mycobacterial polyketide synthase Pks13. J Biol Chem. 287:33675-90. Epub 2012 Jul 23. Delaine T, Bernardes-Génisson V, Quémard A, Constant P, Cosledan F, Meunier B, Bernadou (2012) Preliminary Investigations of the effect of Lipophilic Analogs of the active Metabolite of Isoniazid towards Bacterial and Plasmodial Strains. Chemical Biology & Drug Design, ISSN 1747-0285, 79: 1001-1006. Epub 2012 Apr 10. Mourer M, Massimba Dibama H, Constant P, Daffé M, Regnouf-de-Vains JB. Anti-mycobacterial activities of some cationic and anionic calixarene derivatives. (2012) Bioorg Med Chem. 20:2035-41. Warrier T, Tropis M, Werngren J, Diehl A, Gengenbacher M, Schlegel B, Schade M, Oschkinat H, Daffe M, Hoffner S, Eddine AN, Kaufmann SH. (2012) Antigen 85C Inhibition Restricts Mycobacterium tuberculosis Growth through Disruption of Cord Factor Biosynthesis. Antimicrob Agents Chemother. 56:1735-43. Lanéelle MA, Launay A, Spina L, Marrakchi H, Laval F, Eynard N, Lemassu A, Tropis M, Daffé M, Etienne G. (2012) A novel mycolic acid species defines two novel genera of the Actinobacteria, Hoyosella and Amycolicicoccus. Microbiology. 158:843-55. Shui G, Bendt AK, Jappar IA, Lim HM, Laneelle M, Hervé M, Via LE, Chua GH, Bratschi MW, Rahim SZ, Michelle AL, Hwang SH, Lee JS, Eum SY, Kwak HK, Daffé M, Dartois V, Michel G, Barry CE 3rd, Wenk MR. (2012) Mycolic acids as diagnostic markers for tuberculosis case detection in humans and drug efficacy in mice. EMBO Mol Med. 4:27-37. Marchand CH, Salmeron C, Raad RB, Méniche X, Chami M, Masi M, Blanot D, Daffé M, Tropis M, Huc E, Le Maréchal P, Decottignies P, Bayan N. (2012) Biochemical disclosure of the mycolate outer membrane of Corynebacterium glutamicum. J Bacteriol. 194:587-97. Deraeve C, Dorobantu IM, Rebbah F, Le Quéméner F, Constant P, Quémard A, Bernardes-Génisson V, Bernadou J, Pratviel G. (2011) Chemical synthesis, biological evaluation and structure-activity relationship analysis of azaisoindolinones, a novel class of direct enoyl-ACP reductase inhibitors as potential antimycobacterial agents. Bioorg Med Chem. 19:6225-32. Cantaloube S, Veyron-Churlet R, Haddache N, Daffé M, Zerbib D. (2011) The Mycobacterium tuberculosis FAS-II dehydratases and methyltransferases define the specificity of the mycolic acid elongation complexes. PLoS One. 6:e29564. Krishnan N, Malaga W, Constant P, Caws M, Tran TH, Salmons J, Nguyen TN, Nguyen DB, Daffé M, Young DB, Robertson BD, Guilhot C, Thwaites GE. (2011) Mycobacterium tuberculosis lineage influences innate immune response and virulence and is associated with distinct cell envelope lipid profiles. PLoS One. 6:e23870. Slama N, Leiba J, Eynard N, Daffé M, Kremer L, Quémard A, Molle V. (2011) Negative regulation by Ser/Thr phosphorylation of HadAB and HadBC dehydratases from Mycobacterium tuberculosis type II fatty acid synthase system. Biochem Biophys Res Commun. 412:401-6. Rath P, Demange P, Saurel O, Tropis M, Daffé M, Dötsch V, Ghazi A, Bernhard F, Milon A. (2011) Functional expression of the PorAH channel from Corynebacterium glutamicum in cell-free expression systems: implications for the role of the naturally occurring mycolic acid modification. J Biol Chem. 286:32525-32. De P, Koumba Yoya G, Constant P, Bedos-Belval F, Duran H, Saffon N, Daffé M, Baltas M. (2011) Design, synthesis, and biological evaluation of new cinnamic derivatives as antituberculosis agents. J Med Chem. 54:1449-61. Azéma, J., Guidetti, B., Korolyov, A., Lamoral-Theys, D., Gras, T., Dubois, J., Kiss, R., Roques, C., Constant, P., Daffé, M. and Malet-Martino, M. (2011) Synthesis of Lipophilic Dimeric C-7/C-7-linked Ciprofloxacin and C-6/C-6-linked Levofloxacin Derivatives. Versatile In Vitro Biological Evaluations of Monomeric and Dimeric Fluoroquinolone Derivatives as potential Antitumor, Antibacterial or Antimycobacterial agents. Eur. J. Med. Chem. 46: 6025-6038. Roux, A.-L, Ray, A., Pawlik, A., Medjahed, H., Etienne, G., Rottman, M., Catherinot, M., Coppée, J.-Y., Chaoui, K., Monsarrat, B., Toubert, A., Daffé, M., Puzo, G., Gaillard, J.-L., Brosch, R., Dulphy, N., Nigou, J. and Herrmann, J.-L. (2011) Over-expression of proinflammatory TLR-2-signaling lipoproteins in hypervirulent mycobacterial variants. Cell Microbiol. 13:692-704. Wang, X-M, Lu, C., Soetaert, K., S’Heeren, C., Peirs, P. ; Lanéelle, M.-A., Lefèvre, P., Bifani, P. Content, J., Daffé, M, Huygen, K., De Bruyn, J., Wattiez, R. (2011) Biochemical and immunological characterization of a cpn60.1 knockout mutant of Mycobacterium bovis BCG. Microbiology 157:1205-19. Koeck, J.-L., Fabre, M., Simon, F., Daffé, M., Garnotel, E., Matan, A.B., Gérôme, P., Bernatas, J.-J., Buisson, Y. and Pourcel, C. (2011) Clinical characteristics of the smooth tubercle bacilli "Mycobacterium canettii" infection suggest the existence of an environmental reservoir. Clin Microbiol Infect. 17 :1013-9. Tamara Delaine, Vania Bernardes-Génisson, Annaïk Quémard, Patricia Constant, Bernard Meunier and Jean Bernadou (2010). Development of isoniazid-NAD truncated adducts embedding a lipophilic fragment as potential bi-substrate InhA inhibitors and antimycobacterial agents. European Journal of Medicinal Chemistry, ISSN1768-3254, 45:4554-4561. Jang J, Stella A, Boudou F, Levillain F, Darthuy E, Vaubourgeix J, Wang C, Bardou F, Gilleron M, Puzo G, Burlet-Schiltz O, Monsarrat B, Brodin P, Gicquel B, Neyrolles O. (2010). Functional characterization of the Mycobacterium tuberculosis serine/threonine kinase PknJ. Microbiology. 156: 1619-1631. Sani, M., Houben, E.N.G., Geurtsen, J., Pierson, J., de Punder K., van Zon, M., Wever, B., Piersma, S.R., Jiménez, C.R., Daffé, M, Appelmelk, B., J., Bitter, W., van der Wel, N. and Peters, P.J. (2010). Direct visualization by cryo-EM of the mycobacterial capsular layer: a labile structure containing ESX-1-secreted proteins. PLoS Pathog. 6: e1000794. Deshayes, C., Bach, H., Euphrasie, D., Attarian, R., Coureuil, M., Sougakoff , W., Laval, F., Av-Gay, Y., Daffé, M, Etienne, G., and Reyrat, J.-M. (2010). MmpS4 promotes glycopeptidolipids biosynthesis and export in Mycobacterium smegmatis. Mol. Microbiol. 78: 989-1003. Bou Raad, R., Méniche, X., de Sousa-d’Auria, C., Chami, M., Salmeron, C., Tropis, M., Labarre, C., Daffé, M, Houssin, C. and Bayan, N. (2010). A deficiency in arabinogalactan biosynthesis affects Corynebacterium glutamicum mycolate outer membrane stability. J. Bacteriol., 192: 2691-2700. Sacco, E., Slama, N., Bäckbro, K., Parish, T., Laval, F., Daffé, M, Eynard, N. and Quémard, A. (2010) Revisiting the assignment of Rv0241c enzyme to the Fatty Acid Synthase type II of Mycobacterium tuberculosis. J. Bacteriol.192: 4037-4044. Dhouib, R., Laval, F., Carrière, F., Daffé, M and Canaan, S. (2010). 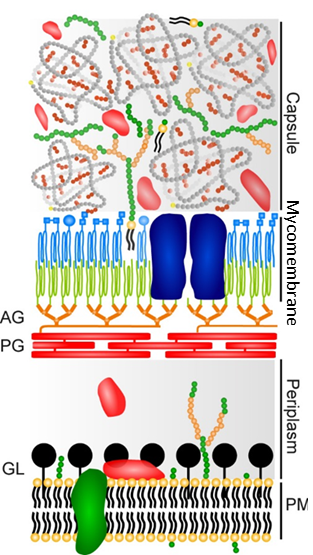 A monoacylglycerol lipase from Mycobacterium smegmatis involved in the bacterial cell interaction. J. Bacteriol.192: 4776-4785. Siméone, R., Léger, M., Constant, P., Malaga, W., Marrakchi, H., Daffé, M, Guilhot, C. and Chalut, C. (2010) Delineation of the roles of FadD22, FadD26 and FadD29 in the biosynthesis of phthiocerol dimycocerosates and related compounds in Mycobacterium tuberculosis. FEBS J. 277: 2715-2725. Movahedzadeh, F., Wheeler, P.R., Dinadayala P., Av-Gay, Y., Parish, T., Daffé, M and G. Stoker, N.G. (2010). Inositol monophosphate phosphatase genes of Mycobacterium tuberculosis. BMC Microbiol 10:50. Termentzi, A., Khouri, I., Gaslonde, T., Prado, S., Saint-Joanis, B., Bardou, F., Amanatiadou, E.P., Vizirianakis, I.S., Kordulakova, J., Brosch, R., Janin, Y., Daffé, M, Tillequin, F. and Michel, S. (2010) Synthesis, biological activity, and evaluation of the mode of action of novel antitubercular benzofurobenzopyrans substituted on A ring. Eur. J. Med. Chem. 45: 5833-5847. Flores-Valdez, M. A., Morris, R. P., Laval, F., Daffé, M and Schoolnik, G.K. (2009) Mycobacterium tuberculosis modulates its cell surface via an oligopeptide permease (Opp) transport system. FASEB J. 23: 4091-4104. Ripoll, F. Pasek, S., Schenowitz, C., Dossat, C., Barbe, V., Rottman, M., Macheras, E., Heym, B., Herrmann, J.-L., Daffé, M, Brosch, R., Risler, J.-L. and Gaillard, J.L. (2009) Non mycobacterial virulence genes in the genome of the emerging pathogen Mycobacterium abscessus. PLoS One. 4: e5660. Rafidinarivo, E, Lanéelle, M.-A. , Montrozier, H., Valero-Guillén, P., Astola, J., Luquin, M, Promé, J.-C. and Daffé, M. (2009) Trafficking Pathways of Mycolic Acids: structures, origin, mechanism of formation and storage form of mycobacteric acids. J. Lipid Res. 50: 477-490. Léger, M., Gavalda, S., Guillet, V, Van der Rest, B., Slama, N., Montrozier, H., Mourey, L., Quémard, A., Daffé, M and Marrakchi, H. (2009) The Dual Function of the Mycobacterium tuberculosis FadD32 Required for Mycolic Acid Biosynthesis. Chem. Biol. 16:510-519. Etienne, G, Malaga, W., Laval, F., Lemassu, A., Guilhot, C. and Daffé, M (2009) Identification of the polyketide synthase involved in the biosynthesis of the surface-exposed lipooligosaccharides in mycobacteria. J. Bacteriol. 191: 2613-2–21. Rafidinarivo, E, Lanéelle, M.-A. , Montrozier, H., Valero-Guillén, P., Astola, J., Luquin, M, Promé, J.-C. and Daffé, M (2009) Trafficking Pathways of Mycolic Acids: structures, origin, mechanism of formation and storage form of mycobacteric acids. J. Lipid Res. : 50: 477–490. Koumba Yoya, G., Bedos-Belval, F., Constant, P., Duran, H., Daffé, M and Baltas, M. (2009) Synthesis and Evaluation of a Novel Series of Pseudo-Cinnamic Derivatives as Antituberculosis Agents. Bioorg. & Med.l Chem. Lett. 19: 341–343. Kocincova, D. Winter, N., Euphrasie, D., Daffé, M, Reyrat, J.-M. and Etienne, G. (2009) The cell surface-exposed glycopeptidolipids confer a selective advantage to the smooth variants of Mycobacterium smegmatis in vitro. FEMS Microbiol. Lett. 290: 39-44. Mario Alberto, F.-V., Morris, R. P., Laval, F., Daffé, M and Schoolnik, G.K. (2009) Mycobacterium tuberculosis modulates its cell surface via an oligopeptide permease (Opp) transport system. FASEB J. 23: 4091-4104. Huet G, Constant P, Malaga W, Lanéelle MA, Kremer K, van Soolingen D, Daffe M, Guilhot C. (2009) A lipid profile typifies the beijing strains of Mycobacterium tuberculosis: Identification of a mutation responsible for a modification of the structures of phthiocerol dimycocerosates and phenolic glycolipids. J. Biol. Chem. 284 : 27101-27113. Abomoelak, B., Hoye, E.A., Chi, J., Marcus, S.A., Laval, F., Bannantine, J.P., Ward, S.K., Daffé, M, Liu, H.D. and Talaat, A.M. (2009) mosR, a novel transcriptional regulator of hypoxia and virulence in Mycobacterium tuberculosis. J. Bacteriol. 191: 5941-5952. Hickey, T.B., Thorson, L.M., Speert, D.P., Daffé, M and Stockes, R.W. (2009) Mycobacterium tuberculosis Cpn60.2 and DnaK are located on the bacterial surface where Cnp60.2 facilitates efficient bacterial association with macrophages. Infect. Immun. 77: 3389-3401. Dorner, U., Schiffler, B. Lanéelle, M.-A., Daffé, M and Benz, R. (2009) Identification of a cell wall channel in the corynomycolic acid free Gram positive bacterium Corynebacterium amycolatum. Int. Microbiol. 12: 29-38. Geurtsen, J., Chedammi, S., Mesters, J., Cot, M., Driessen, N.N., Sambou, T., Kakutani, R., Ummels, R., Maaskant, J., Takata, H., Baba, O. Terashima, T., Bovin, N., Vandenbroucke-Grauls, C.M.J.E., Nigou, J., Puzo, G., Lemassu, A., Daffé, M and Appelmelk, B.J. (2009) Identification of mycobacterial alpha-glucan as a novel ligand for DC-SIGN: involvement of mycobacterial capsular polysaccharides in host immune modulation. J. Immunol. 183:5221-5231. Meniche X., Labarre, C., de Sousa-d’Auria C., Huc, E., Laval, F., Tropis, M., Bayou, N., Portevin, D., Guilhot, C., Daffé, M* and Houssin C.*, Identification of a Stress-Induced Factor of Corynebacterineae That Is Involved in the Regulation of the Outer Membrane Lipid Composition. J. Bacteriol. 191:7323-7332. Bardou F., Boulon R., Bousquet M.P., Burlet-Schiltz O., Daffé M., Ducoux-Petit M., Eynard N., Gavalda S., Lefebvre C. & Quémard A. "HadD, a novel protein of the mycobacterial fatty acid synthase type II". Deposit of European patent # EP17306041.9 (2017/08/03). Bannantine JP, Bay S, Etienne G & Biet F. "Antigenic tripeptides derived from Mycobacterium avium subsp. paratuberculosis S-type strains, derivatives and uses thereof". Deposit of International patent # PCT/IB2016/002018 (2016/12/20), World patent # WO2018/115183 (A1) (2018/06/28). Quémard A., Labesse G., Daffé M., Marrakchi H., Ducasse S., Cohen-Gonsaud M., Douguet D., “ Use of MabA (FabG1) protein of Mycobacterium tuberculosis for designing and screening antibiotics ”. Publication of French patent # FR2837836, World patent # WO 03/082911 (2003/10/09), USA patent # US2010/0240084 on the (2010/09/23), European patent # EP1490491 (2007/03/14), Spanish patent # ES2283790 (01/11/2007), German patent # DE60312497 (20/09/2007), Australian patent # AU2003258723 (13/10/2003). Quémard A., Labesse G., Cohen-Gonsaud M., Ducasse-Cabanot S., Daffé M. « Complexes of NADP with the protein MabA of Mycobacterium tuberculosis or with a mutant thereof, and their uses for designing and screening antibiotics». Publication of USA patent # US2010/0113291 (2010/05/06), World patent # WO 2007107335 (2007/09/27), European patent # EP1996611 (2008/12/03), Canadian patent # CA2647096 (2007/09/27). Quémard A., Daffé M., Sacco E., Jones T.A., Bäckbro K., Suarez Covarrubias A. « (3R)-hydroxyacyl-ACP dehydratase enzymes involved in mycolic acid biosynthesis and their use for antibiotic screening ». Publication of French patent # FR2912422 (2008/08/15), World patent # WO2008129146 (2008/10/30), USA patent # US-2010-0143940-A1 (2010/06/10), European patent #EP2126068 (2009/12/02) and Canadian patent # CA2677734 (2008/10/30). Delaine T., Bernadès-Génisson V., Quémard A., Bernadou J., « Novel anti-infectious derivatives, method for the production thereof, pharmaceutical compositions containing same and uses of said derivatives in treatment ». Publication of French patent # FR2927331 (2009/08/14), World patent #WO2009/101345 (2009/08/20), European patent # EP2240449 (2009/08/20), USA patent # US 2011/0092536 (2011/04/21) and # US8710073 (B2) (2014/04/29), and Japanese patent # JP 2011511050 (2011/04/07). Lemassu A., Daffé M., Jackson M., Sambou T. “Screening of antituberculous drugs”. Deposit of international extension patent # PCT/FR2009/050632 (09/04/2009), publication 1000050965. - Katholieke Universiteit Leuven (Belgium). - Colorado State University, Fort-Collins (USA). - Instituto de Biologia Molecular y Celular de Rosario (IBR), CONICET (Rosario, Argentina). - UMR Infectiologie et Santé Publique, INRA Tours-Nouzilly. - Department Structural Biology and Biophysics: teams of Lionel Mourey, Odile Schiltz and Alain Milon. 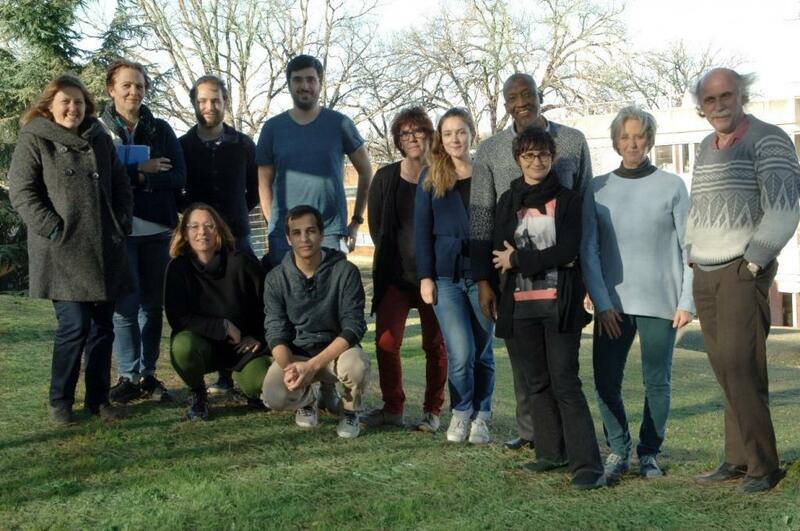 - Department Cancer Biology: team of P. Calsou. • Jan 2019-2021: PHC Polonium (Hubert Curien Partnership) “Exploration of functional complexes in mycobacteria for novel anti-TB drug discovery”. • Nov 2018-Oct 2021: Project MSDAVENIR "Unconventional Strategies for Tuberculosis Treatment". • 01/2015-09/2019: National Agency for Research (ANR, ANR-Appel à projets générique) ANR-14-CE16-0012:"FASMY - An integrative study of the mycobacterial Fatty Acid Synthase type II, a strategic target for novel TB drugs. "Partners: Teams of O. Schiltz (IPBS), L. Mourey (IPBS), P. Bron (CBS, Univ. Montpellier 1). • Jan-Juin 2019 : Call for Projects FONROGA (Fondation Roland Garrigou). Master Fellowship (6 months). "The Fatty Acid Synthase-II complex, a strategic target for new drugs against TB and other mycobacterial infections". • Jan-Juin 2019 : Call for Projects FONROGA (Fondation Roland Garrigou). Master Fellowship (6 months). "Functional exploration of proteins involved in mycobacterial lipid metabolism". • 01/01/2012-31/12/2014: France-Argentina ECOS-Sud Cooperation Program. "In vitro reconstitution of the complete mycolic condensation system of Mycobacterium tuberculosis." Partners: Instituto de Biologia Molecular y Celular de Rosario (IBR) –CONICET- Dpto de Microbiología. Fac. De Ciencias Bioquímicas y Farmacéuticas - Rosario – Argentina; Institut de Pharmacologie et de Biologie Structurale, CNRS/UPS UMR 5089, Toulouse (France). • 04/2010-09/2014: European project HEALTH-F4-2010-241587 - Systems Biology (SysteMTb) 7th framework to understand key feature of Mycobacterium tuberculosis. • Target-based and phenotypical screening of inhibitors.